The Msgr. John T. Mitchell Scholarship presented 21 African American Catholic high school students with more than $16,000 in high school scholarships recently, and a gala Friday, April 27 at the St. John Neumann Center in North Philadelphia celebrated the achievement. Among the dignitaries attending were Auxiliary Bishop John J. McIntyre and Brother Ernest J. Miller, F.S.C., La Salle University’s vice president for mission, who gave the keynote speech. Catholic attorney Dawn Chism-Simms received this year’s St. Martin de Porres Medal. The highlight of the evening was clearly when the students received their accolades. The award recipients represented 13 high schools from a cross-section of the Archdiocese of Philadelphia. Eight students were present to pick up their scholarships. “You need to be able to get a true critical education,” Brother Miller said in his keynote talk, adding that the students’ goal should not simply be to ace the ACT, SAT or any other standardized test. He stressed the importance of getting a holistic education where they would walk away with critical thinking skills that could emulate civil rights leader and scholar W.E.B. Du Bois or Catholic theologian Sister Thea Bowman. He said he hoped the students were “infused with virtue and culture” as they fulfilled their destiny. Bishop McIntyre said he attended Philadelphia Archdiocese schools beginning in first grade. He reminded his audience that at one time there were no Catholic kindergartens, so he attended his neighborhood public school in the city’s Germantown section before attending parochial school. “I am grateful for the time I spent in Catholic schools,” he said. Ollie Fisher, 17, was among those who received scholarships at the banquet. The student at Roman Catholic High School and member of St. Athanasius Parish in the city’s West Oak Lane section has his sights set on studying sports medicine in college. He hopes to attend Penn State University. He said he could relate to the bishop’s parochial school experience. “The only difference is that I did go to Catholic school for kindergarten,” he said. Cameron James gave the official reflection from a Mitchell Scholar during the program. He is a student at Archbishop Wood High School and a member of St. William Parish in Northeast Philadelphia. “Catholic school and life has helped me in many ways,” James said. 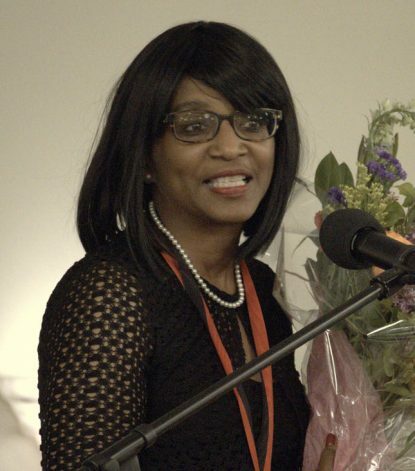 Honored for her contributions to the Black Catholic community, she is a lawyer and an alumnus of West Catholic High School, Villanova University and the University of Pennsylvania School of Law. She has long been active in the Philadelphia Serra Club, which works to increase vocations to the priesthood and religious life. The Mitchell Scholarship fund was announced on March 3, 2008 by Cardinal Justin Rigali, retired archbishop of Philadelphia. The archdiocese received a bequest from the estate of Navy Capt. Dolores Cornelius to fund a scholarship in Msgr. Mitchell’s name. During his long ministry as a priest of the archdiocese from 1939 to 1981, Msgr. Mitchell was pastor of St. Ignatius of Loyola and St. Francis de Sales parishes, both predominantly African American churches in West Philadelphia. He was also the founder of the St. Ignatius Nursing Home. 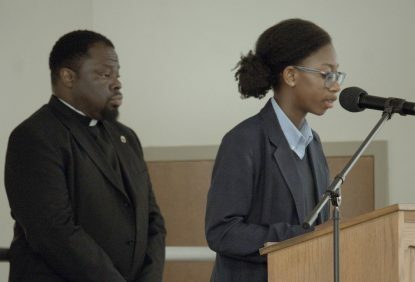 The scholarship was established to support African American Catholic high school students in the Philadelphia Archdiocese. Students must be both academically talented and in financial need. Since its inception the fund has given 118 grants totaling $138,000. 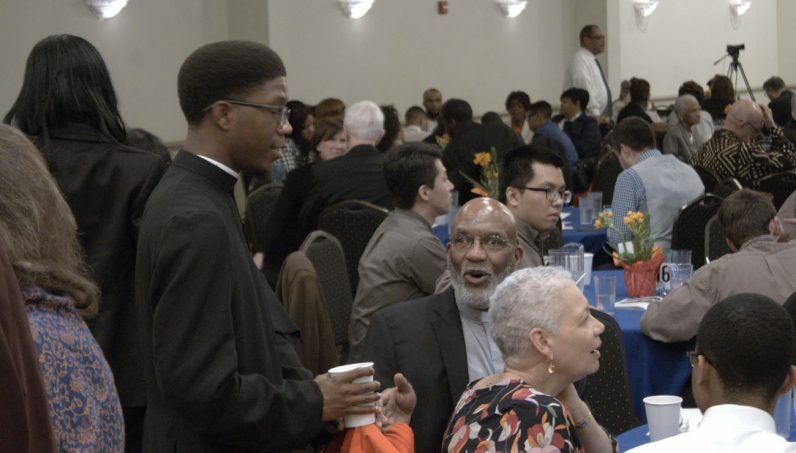 The fundraising banquet is held biannually and is hosted by the archdiocesan Office for Black Catholics.